Calendar Launch & Holiday Party! Join us to celebrate the end of one year of resistance and the promise of another, and for your last chance in 2015 to buy copies of Certain Days: Freedom for Political Prisoners Calendar. 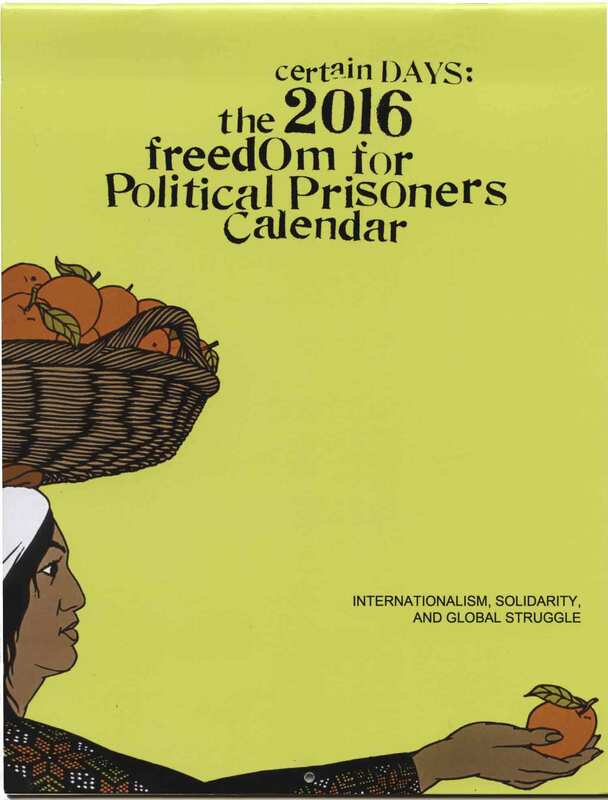 The calendar is a joint fundraising and educational project between outside organizers in Montreal and Toronto, and three political prisoners being held in maximum-security prisons in New York State: David Gilbert, Robert Seth Hayes and Herman Bell. The initial project was suggested by Herman, and has been shaped throughout the process by all of our ideas, discussions, and analysis. All of the members of the outside collective are involved in day-to-day organizing work other than the calendar, on issues ranging from refugee and immigrant solidarity to community media to prisoner justice. We work from an anti-imperialist, anti-racist, anti-capitalist, feminist, queer and trans positive position. Addameer Prisoner Support and Human Rights Association is a Palestinian non-governmental, civil institution which focuses on human rights issues (Addameer is Arabic for conscience). Established in 1992 by a group of activists interested in human rights, the center’s activities focus on offering support for Palestinian prisoners, advocating the rights of political prisoners, and working to end torture through monitoring, legal procedures and solidarity campaigns. The New York State Task Force on Political Prisoners is dedicated to winning the release of political prisoners in New York prisons. The Task Force includes representatives of the Malcolm X Grassroots Movement, New Afrikan Liberation Front, The Jericho Movement, and Resistance Brooklyn. There will be calendars on sale for $12.